There is much debate on whether or not to use Reading Logs. I myself have gone back and forth on them. I really don't like the "you read for 30 minutes and mom signs" logs. They just weren't working for me. I didn't feel like the kids were actually reading, or getting anything out of it. So I decided to create my own. I wanted the students to have to respond to what they were reading in a meaningful way. To help try to ensure this, I created a 5 part response log, with different responses each day. The students choose which response they want to do, and complete one part a night. They then get the log back the next day to repeat the process. By the end of the week, they have done 4 responses of their choosing (with one response left on the log). The next week, they get a brand new log, with new responses to choose from! Just click on the picture and it will take your right to all the reading logs! For me, this has been a successful way to not only help keep the kids accountable for the nightly reading, but also to get them WRITING about it! 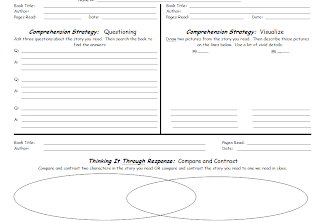 They love the graphic organizers and are really into the Comprehension Strategies on there. They also like the element of choice. *I* love that they don't realize how much thinking the students are actually doing! Win-win for all! And here are some books that I LOVE, in case you are looking for books for your students to read and respond to! Awesome reading log! Thanks for sharing! This is great! I will be using this after the holidays : ) Thanks for sharing! This is a great way to keep students honest and engaged! I will be using this next semester! Thanks for sharing! I have been searching for an effective way to keep them accountable, while keeping them engaged. Thanks so much for sharing! I will be using this with my 4th graders next semester! Thank you everyone for your kind words. I am glad you are finding ways to use this in your classroom! I love your reading log! P-E-R-F-E-C-T! Thank you SO much for sharing your resources! I am also a Stephanie and a 5th grade teacher! It is my first year and with a curriculum transition, I've had difficulty figuring out what content to teach and how to teach it. I'm now making my own curriculum and just relishing any resources from effective teachers. They mean a lot-thank you again! This is so much better than what I am doing (and killing myself trying to MAKE them do). This will go into effect in February (since I'm already committed to the January Log-boo hiss). I'm pinning this, too, so that I will remember! Do you change the types of responses or keep the same ones week by week? I LOVE this! I was just about ready to toss the idea of reading logs for next year, and now I don't have too! Thanks! How do you hold kids accountable for ACTUALLY doing this?? Do you assign grades??? Do your students keep this log in their reading journal? Also do you require your students to read a certain amount of time? I have used the "100 minutes" read at home. I like this idea much better! Thank you very much. Your blog is awesome... I've been teaching for 9 years now, but am always looking for new ideas. I've bookmarked a ton of your ideas and look forward to stealing them (I mean borrowing :-)) throughout the upcoming school year. Do you use these Reading logs in conjunction with the Reading Olympics, or are those two different projects from two different years? Looking forward to hearing from you! Would it be possible to get this in an editable format? I would like to add a couple housekeeping things to the forms to make it match what my school asks us to do, but otherwise I love the forms!!! The kids are enjoying them too, since there's variety for them rather than just a daily summary. Thank you for what you do!!! What grade level would you advise using this reading log with?